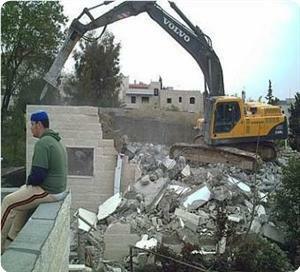 The Israeli occupation authority (IOA) forced a Palestinian citizen in the occupied city of Jerusalem to demolish his home under the pretext that it was built without permit. According to local sources, the IOA-controlled Jerusalem municipality forced the citizen Munther Hijazi, 57, to demolish his house at Saadia neighborhood in Jerusalem, which is inhabited by nine people. Hijazi said that the occupation ordered him to demolish his house and imposed on him fines of about 80 thousand shekels (about $22 thousand), under the pretext of construction without permit. He added that thirteen years ago he had paid fines of $36 thousand shekels (about ten thousand dollars), imposed by an Israeli court in Jerusalem for illegal construction. Meanwhile, Israeli press sources claimed that the number of settlers in the West Bank has become almost equal to half the number of Palestinian citizens there, and is still increasing. According to Israeli Yedioth Ahronoth newspaper, there are more than 1.4 million Palestinians living in the West Bank and East Jerusalem, while about 700 thousand of Jews live in the region, including 385 thousand in the West Bank and 300 thousand others in Jerusalem. It described this increase of the Jewish population as "amazing", noting that the number of settlers in the West Bank has doubled since the second Intifada (uprising). 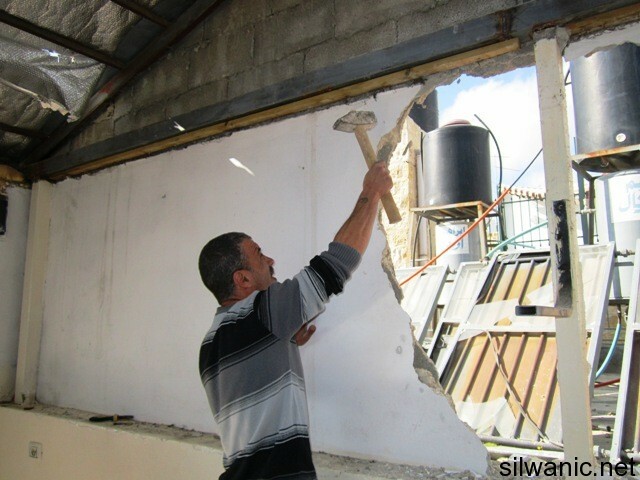 The Jerusalemite, Munther Hijazi, was forced on Saturday afternoon to self-demolish his home that is located in Al-Sa’dyeh neighbourhood in the old city of Jerusalem, after 12 years of building it. The municipality’s court ordered him to completely demolish his home and provide them with pictures to prove it in the next session scheduled on the 17th of September. 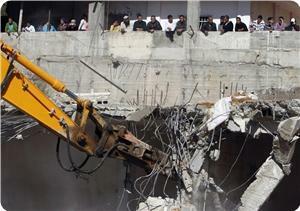 Abu Mohammad 57, his family and the neighbours all participated in the demolition process using a big hammer. Munther built the 55-square meter house in 2000 which is on the third floor and consists of two rooms and a living room and their facilities; Abu Mohammad, his wife, his daughter in law and three other sons where the oldest is 9 years old and the youngest is two all lived in the apartment. Abu Mohammad explained that in 2001, a 36 thousand NIS building violation fee was imposed on him by the occupation’s municipality which he paid in full. He said that he got surprised in November of 2012 when he received a letter from the municipality stating that the apartment should be demolished. He hired a lawyer and the first session was conducted on 12/02/2013, and the case was postponed until the 27th of May when the court asked him to either pay outrageous amounts of money or have the municipality’s employees demolish his home or self-demolish it. He also said that he will remain in the old city of Jerusalem because he can’t live outside of it since he was born and raised there. Israeli bulldozers started on Tuesday to demolish and bulldoze the yard of the school of Azzun village after ordering the teachers to leave the place. Tadhamun Foundation stated in a report that the occupation bulldozed the yard and garden of school of Azzun - Beit Amin southern the city of Qalqilya, and which is built on an area of two dunums. The forces demolished the walls of the school's garden and uprooted 107 olive trees; in order to complete the construction of the apartheid wall and to build a security street between the school and the Sha'arei Tikva settlement established on the village's lands. The headmaster Jamal Ayoub told Tadhamun Foundation: "Every morning Israeli soldiers intentionally obstruct the students from arriving to school. They detain them for hours and search their bags in provocative ways." He added the occupation took advantage of the summer vacation and started bulldozing the school's garden, demolishing the walls and uprooting the trees, in preparation for grabbing the land. Ayoub pointed out that Israel has recently turned the school into a military barracks, in light of the intensive presence of large forces military in the school's gardens, yards and classrooms. Activist in popular resistance Murad Eshteiwi said that these practices are serious and a flagrant violation of the Rights of the Child. For his part, researcher at the Tadhamun Foundation Ahmed Betawi said that the attack on the Azzun village's school represents the seventh assault against the Palestinian educational institutions since the beginning of the year. Betawi said that the Israeli soldiers have always targeted the Palestinian educational facilities, including the teachers and students. The Israeli occupation authority (IOA) served demolition notices to owners of nine houses in Duma village, south of Nablus, on Thursday. Ghassan Daghlas, monitoring settlement activity north of the West Bank, said that Israeli occupation forces raided Duma village and ordered owners of nine houses to evacuate their homes because they were built without permit and would be razed. He said that the houses provided shelter to many children and were owned by members of the Dawabshe family including two brothers. The Israeli occupation authorities (IOA) sent troops into Jenin province on Wednesday night to look for water wells. Local sources said that the Israeli occupation forces raided southern Jenin and erected roadblocks at the entrance to the city. Meanwhile, eyewitnesses said that IOF units were deployed in the area between Zababde and Qabatiya villages to look for water wells and demolish them. 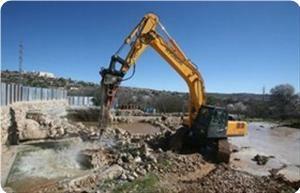 They said that the IOF units accompanied water experts and employees with the civil administration. 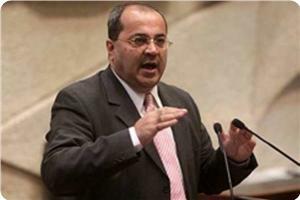 Arab Knesset member Ahmed Al-Tibi said the price tag attacks that are launched by Jewish settlers on the Palestinian natives and their property in the occupied Palestinian lands are the result of the racist laws that were sanctioned by the Israeli government. Tibi made his remarks in a UN conference held on Wednesday in Beijing on the Arab-Israeli conflict. "Israel pursues a racial discrimination policy against the Arab minority in the 1948 occupied lands and does not deal with them as citizens with equal rights; therefore, we appeal to the UN members as states and organizations to pressure the Israeli government and help the Arab minority, the rightful owner of land, in its struggle against the wave of racism," Tibi stated. He affirmed that the Israeli government started to study proposals and draft laws that would worsen the situation against the Arabs such as the military service law, the oath of loyalty to the Jewish state and the abolition of the Arabic language as an official language. The lawmaker noted that one of the most dangerous plans prepared by the Israeli government against the Palestinians in the 1948 occupied land is its intention to displace thousands of Bedouin families from their villages in the Negev area and seize their lands. Israeli authorities have started using registered mail to inform Palestinians of land confiscations, a Palestinian Authority official said Wednesday. Israel's Civil Administration has sent letters to a number of Nablus residents informing them of decisions to confiscate their land, said Ghassan Daghlas, who monitors settlement activity. Daghlas said the unprecedented move was "dangerous." 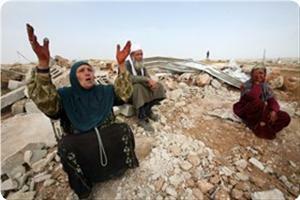 Israeli forces usually deliver confiscation decisions and home demolition notices by hand. The Israeli authorities went on the rampage for the 52nd time and razed the entire Bedouin village of Araqib in the Negev on Wednesday. The Israeli radio said that inspectors at the interior ministry and the land of Israel department destroyed the temporary houses of Araqib village for being “illegal”. Inhabitants of the village have rebuilt the village, with the help of Negev Bedouins and activists, each time the Israeli authorities flattened it. Informed Palestinian official sources revealed that the Israeli occupation authority (IOA) changed the path of its segregation wall in Rantis village, northwest of Ramallah city in order to drill oil and gas wells. 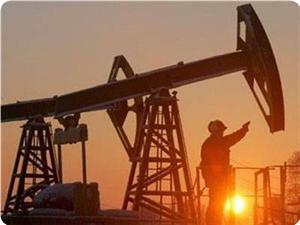 According to the sources, the IOA already started to extract oil and gas from Rantis village near the oil well Majd 5. Youth activists posted on the internet pictures of heavy machinery which was placed at the oil extraction site. They said that such oil production activities in addition to the Israeli military drills cause considerable environmental damage to the natural life in the Palestinian village. Violence came to Bethlehem last May on a quiet Sunday morning. According to a report from the International Middle East Media Center, on 12 May 2013, Israeli soldiers fired concussion grenades at demonstrators who tried to enter Ush Ghrab, a section of the Bethlehem town of Beit Sahour. Owned by generations of Palestinians, Israel wants to use the land at Ush Ghrab for part of a planned Jewish settlement. Attacks by Israeli soldiers on villagers who protest the taking of their land occur regularly throughout the occupied West Bank but until recently, demonstrators at Ush Ghrab had been left alone. Israel straddles a fine line in Bethlehem. Located close to the Church of the Nativity, birthplace of Jesus, the rights to the historically Christian land are being gauged against the avarice of newcomers eager to take it. Less than a mile away from the venerated church, an attack on Ush Ghrab appears as an attack on the Christian values brought by the Prophet of Peace. Surely, the use of force to control peaceful demonstrators does not bode well for Israel eager for the support from fundamental Christians, or for humanitarian values sustained by the rest of the world. Ush Ghrab, an Arab word meaning, “crows nest” reflects an historic bond between nature and the agricultural heritage of lands farmed by generations of Palestinians. Under occupation, the movements of every Palestinian are controlled by Israel. Each day thousands of foreign visitors come to Bethlehem’s Church of the Nativity and take the ten-minute bus ride to Shepherds Field where Christians believe shepherds sighted the bright star leading to the birthplace of Jesus. Closely guarded, tourists are quickly hustled, and warned against leaving the group to explore on their own. They leave without meeting a local Palestinian, and unaware of their desperate plight. 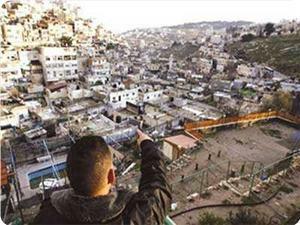 New settlements now encircle the entire Bethlehem area. For a time, the Beit Sahour community remained hopeful that the violence directed at other West Bank demonstrators would not come to them. Seldom reported in mainstream US media, Americans remain unaware of the daily attacks by hostile Jewish settlers and by the Israeli soldiers charged with defending them. Tear gas, rubber coated metal bullets, sound grenades and “skunk water” spray are attempts to deter demonstrations against land confiscation; yet, in spite of injuries, arrests and the deaths of ordinary civilians, the protests grow. Construction of the “peace park” began that April. Shortly thereafter, Israeli protesters began to demonstrate against its existence and against the presence of Palestinians on “their land.” In 2008 Women in Green, an Israeli settler organization, began to arrange activities in the area they call Shdema in preparation for the establishment of a Jewish settlement. 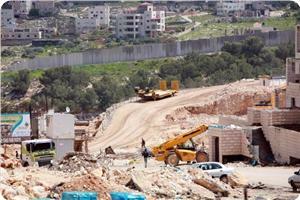 The group claims that Arab Beit Sahour is illegally building the community center on part of their rightful Jewish land. Knesset members Arieh Eldad and Minister of Foreign Affairs Avigdore Lieberman who live in settlements supported settler efforts. 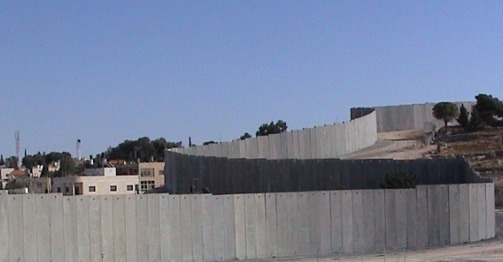 In October 2009, park construction materials purchased with a loan from USAID were confiscated by the Israeli military. They were never returned. In January 2010, the park was vandalized: the Star of David, Hebrew writing and “Israel is Jewish” were spray painted over the park walls. 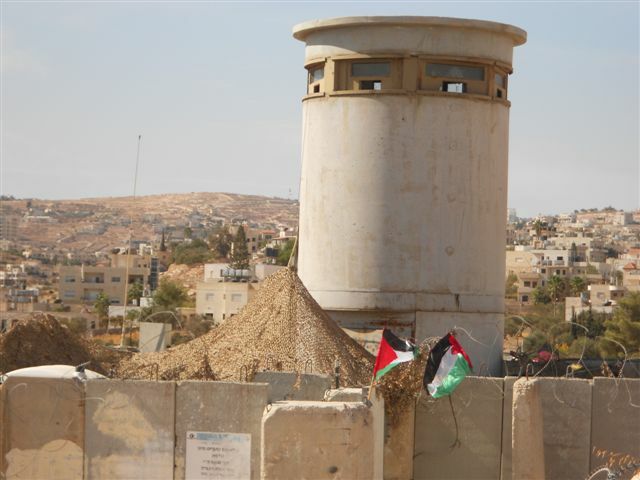 Late in March, rumors were confirmed when a watchtower was installed and the property on the hill was declared a military outpost off limits to Palestinians. The army’s decision to allow illegal Israeli settlers to install a settlement outpost on city land used as a public park infuriated local residents. 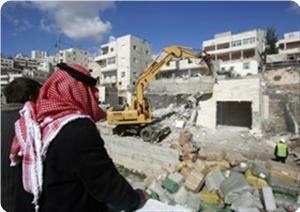 The intention was clear; Bethlehem land at Ush Ghrab was being stolen. Neighboring villages of Al-Khadar, Wadi Foquin and Al-Walaja had also lost valuable farmland to walls and settlements. The plan was predictable: declare a military zone, impose Jewish presence, harass and drive off the indigenous Arab population. Ush Ghrab is the calculated prelude to another land grab by avaricious settlers in the historically Arab region. Sandwiched between the established Jewish settlements of Har Homa and Gush Etzion, Ush Ghrab is strategic because of a nearby bypass road connecting the colonial settlements, thus affording an easy access for colonizers to get to Jerusalem, seven kilometers away. Palestinians are prohibited use the Jewish only roads and are forbidden to enter Jerusalem. I join a group of activists heading for the demonstration site a short distance from the home where I stay. The familiar area has changed. Four years ago, on my first visit to Beit Sahour, hope was high in anticipation of the construction of a new community park. I had watched the park being built, talked with American volunteers excited about working with Palestinian locals and getting to know real Arabs, Christian and Muslim; and mainly getting to understand the people, a the real basis for peace. I watched the rocky terrain smoothed, slides and swings and a climbing tower put up; picnic tables, a barbeque and a soccer field followed. By the end of that summer, the park, designated as “Peace Park,” was about complete; volunteers joined the community to celebrate with a party and soccer game on the new field. Repainted a few days later, Palestinian flags and “Free Palestine” slogans took over the space; soon it was repainted with a large blue Star of David and Hebrew characters. Day by day invisible artists competed for the face of the concrete canvas building in the bizarre art fest. The paint war between Beit Sahour Arab residents and Jewish Shdema settlers continued. When Israel designated the hilltop area a closed military zone, off limits to Palestinians, the dispute was thought settled. It wasn’t. 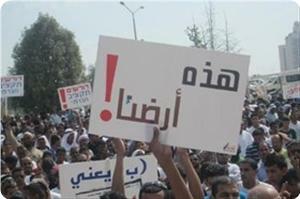 Now, four years later, Ush Ghrab remains contentious. Demonstrators assemble near the park entrance. Facing the hilltop outpost, they unfurl banners and hold high Palestine flags. Two soldiers appear and take positions in front of the concrete building on the hill; two more come. More demonstrators arrive; then more soldiers in full battle gear, automatic rifles aimed menacingly at the unarmed gatherers below. George Rishmawi, IMEMC news director uses a bullhorn to address the community demonstrators and their supporters, imploring them to be steadfast and resistant and to remain nonviolent. Peace activist Mazin Qumsiyeh takes the megaphone; passionate words encourage protesters to continue efforts to resist peacefully. Talks end with a decision to approach settlement leaders and urge Shdema colonists to stop harassing families and children at the Ush Ghrab Park. George and Mazin lead local residents along the rocky hillside road toward the settlement headquarters. Several hours pass; I wait by the park, meet a farmer who says he must hurry to tend his spinach garden before dark. The negotiation team returns at dusk, disappointed but hopeful. The leaders report that talk was polite and respectful, but ended as it had before, with promises but no guarantee of change. A report by IMEMC stated that on Sunday, dozens of Palestinians and international supporters had set up a tent at Ush Ghrab after church services. 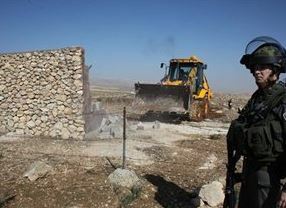 The Popular Resistance Committee in Beit Sahour had organized the action aimed to stop settlement construction in the area. 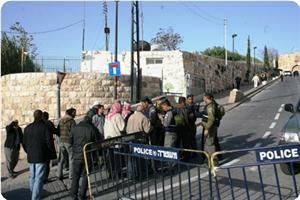 The report said that Israeli soldiers arrived but did not interfere. Setting up “tent cities” on rightful Palestinian territory is a recent non-violent resistance strategy gaining popularity in the West Bank. Aware of the consequences, Palestinian protesters say it serves to irritate the soldiers and highlights Israel’s intention to take over all Palestine land. It is late Sunday morning when I arrive at Ush Ghrab in the company of activists ready to stand their ground. A tent has already been set up midway on the hillside overlooking the park. Two Palestinian flags wave in a soft, warm breeze, one at the base of the hill and the other by the entrance to the ragged tent. I stand beside the tent, look down at the little park and family recreation place across the road. Sunlight glances off the children’s Ferris wheel, livening seats of bright yellow, mossy green and sky blue in a glittery beckoning dance. Above, the outpost stands in eerie silence; sun-warming rays seem repelled by its lifeless cold. No soldiers in sight, but I think, perhaps watchtower cameras execute a covert survey. About a dozen people seated inside the tent smoke and talk in a cacophonous mix of Arab and English, French and Spanish; pleasantly jovial, there seems little concern for impending trouble. I walk alone slowly up the hill; look down at the powdery earth, the rock strewn scrub patches of drought-dusted greenery, my thoughts on its myriad of occupiers. Potshards and bones turned by farmers’ spades attest to centuries of invaders – Recent, the Ottoman, British, Jordanian and now Israel. Following British reign over the Bethlehem area from 1920 to 1948, Jordanians used the outpost as a military base until 1967 when Israel claimed the hill - spoils of a six-day war. My companions leave the tent; others join them and dozens come toward me up the hill. I watch them climb over thorny briers, twist barbed wire out of the way then hoist themselves up onto a ledge approach at the base of the outpost. A young man of about eighteen carries two Palestinian flags. The group disappears around a side of the building. About twenty minutes pass before they reappear. A teenaged girl carries a large Israeli flag. High above the outpost, close to the watchtower, two Palestinian flags wave as if in triumph. Off limits to Palestinians, the defiant mood among the young people reflects victory and empowerment. They talk excitedly about how they entered the vacant building, scattered papers and turned over chairs before leaving. A few days later, I left for the states; at home, my thoughts still on that day at Ush Ghrab, and on the rave new generation of young protesters risking for the land they love. What price this short-lived victory? I wonder. And what will be the fate of their beloved land? A short distance from Ush Ghrab, the Greek Orthodox chapel at Shepherd’s Field holds legacies of the defeated; Roman columns, Greek, Byzantine and Persian art, treasures of the unconquerable. What “gift” will Israel leave? A short distance from the Church of the Nativity, they try to hold on to the patch of precious ground, roughly 97 dunums (0.1 square kilometers) that is Ush Ghrab - Palestine soil. Each day sees more land taken, more lives destroyed, and more neighbors driven off. An uncaring world, hears only Israel’s cry for its right to exist, while desperate Palestinians hover on the brink of extinction. Sadly, US government policy renders unconditional support for Israel while ignoring Palestinian rights and underplaying orchestrated policies of land theft. Without strong censure of Israel’s disregard for international law and with the eye of the US turned away, there seems little chance for survival. The US president hypocritically gives Israel the proverbial “slap on the wrist” while allowing settlements to proceed unabated. Taxpayer aid supplies weapons to ensure Israel remains in “control,” continues confiscation of Palestinian land for Jewish settlements and proceeds with what is clearly, a case of ethnic cleansing. Without the support of a fair broker, anger in the Arab world grows; but so also do worldwide protest movements demanding justice for all. The basis of the Arab Spring, justice for the millions of Palestinians scattered throughout the world lies at the core. High-level “peace” negotiations, doomed before they start, will continue to fail until the basic human rights of all people are on the table. She expresses her excitement about an upcoming Bethlehem celebration “where you can shop on Star Street at local Palestinian markets and enjoy international music, theatre and dance... and Children will be entertained with games, face painting, interactive theatre and more! Her enthusiasm rises above the oppression of occupation. Jerusalem Municipality teams on Monday raided the town of Silwan south of Al-Aqsa Mosque, and distributed several administrative demolition orders for residential and commercial installations. Wadi Hilweh Information Center said in a statement that the Israeli municipal teams have distributed three administrative demolition orders against Palestinian buildings, under the pretext of being built without permit. It said that the municipal teams, accompanied by the occupation police, raided Silwan and handed over an administrative demolition order for a barber shop established on area of 25 square meters and a shop selling meat built on an area of about 25 square meters in the Shaheed Samer Sarhan Street in the town. The Jerusalemite center added that the municipal teams raided a house belonging to the Abbasi family in Ain Louza neighborhood, and ordered its owner to demolish a residential room he has recently built on an area of ​​about nine meters. The Information Center also stated that the Israeli police and army arrested in one day 115 Jerusalemite citizens after raiding their homes and their shops. According to the center, 40 Jerusalemites were arrested from Shuafat refugee camp and Beit Hanina, northeast of Jerusalem, after a raid on their homes and shops. An eyewitness reported that a large Israeli force raided the Manara building in Tel al-Foul area in Beit Hanina, and arrested 25 civilians and took them to the Mascoubiya detention center west of Jerusalem for interrogation. The Manara building was built in 2003 and has 25 apartments inhabited by about 250 Palestinians. The Israeli Municipality imposed on the inhabitants of the building a fine of one million and 400 thousand shekels, and handed them over demolition notices as the Manara was built without license. Wadi Hilweh Information Center noted that the Israeli occupation forces raided the Shuafat refugee camp and arrested seven Palestinians from their shops. They also detained eight others from the West Bank and 75 Jerusalemites after raiding their homes, on charges of illegal construction. The Israeli police and municipal crews have carried out raid campaign at dawn on Monday in Beit Hanina, Salam and Shufat refugee camp near the city of Jerusalem. A number of arrests were reported. The Israeli police broke into a Palestinian building in Tel al-Foul and arrested 25 citizens living in it under the pretext of establishing a building without permit, an eyewitness confirmed. The sources added that a fine of 800 shekels ($225) was imposed against each one of the detainees, pointing out that 80 other citizens were also arrested for the same charge in Salam and Shufat camps. Meanwhile, Israeli forces stormed Shuafat refugee camp and arrested a number of shopkeepers for “tax evasion”. The Jerusalem municipality crews along with the Israeli police raided the village of Silwan on Monday morning, and handed out three administrative demolition orders for commercial facilities. The Israeli authorities have escalated recently its demolition policy against Palestinian properties and escalated settlement constructions in Palestinian neighborhoods within the so-called "Holy Basin"
Israeli forces began demolishing a school on Tuesday in the village of Azzun Atmah in the northern West Bank district of Qalqiliya, the school's administration said. A day earlier Israeli forces entered the Azzun-Beit Amin School to take measurements as they prepare to enforce the further construction of Israel's separation wall in the district. The village also receives children from the Beit Amin village. Israel's national water company Mekorot and the Israeli occupation authority (IOA) declared a plan on Monday to dig an artesian well in Wadi Rababa neighborhood in Silwan district. The information center of Wadi Hilwa-Silwan said that the IOA plans to turn a public place (national park) in Wadi Rababa into a water facility under the administration of Mekorot, noting that the Palestinian residents of this neighborhood were allowed to raise their objections to the plan within 60 days as it was stated in the Israeli announcement. The information center also said that this project would be carried out on an area of 30 dunums of land owned by Palestinian citizens in Wadi Rababa. Wadi Rababa residents, according to Shadi Samreen who lives there, have always been banned from repairing, cultivating or building in their own lands at the pretext they are public places, although they possess deeds proving their ownership of these lands. The information center warned that there are other Israeli plans to seize Wadi Rababa lands in order to carry out service projects for the settlers, noting that some settlers filed a request to open a restaurant in the neighborhood, but the residents officially objected to it. The center noted that the Israeli municipal council in Jerusalem placed one year ago water tanks in Wadi Rababa neighborhood and used water pumps to fill these tanks with water from Ayoub and Ein Loza wells, while the natives are prevented from taking water from these wells. The Israeli government is planning one of its largest schemes to illegally confiscate 22.500 Dunams (5559.87 Acres) that belong to the Palestinians in the West Bank city of Bethlehem, as part of its illegal “Greater Jerusalem” settlement project. Dr. Jad Ishaq, head of the Applied Research Institute (ARIJ) stated that Israel decided to rip-off 22.500 Dunams from Palestinians in Bethlehem, Beit Jala and Beit Sahour. The lands are behind the illegal Apartheid Wall in the area, and illegally fall under the so-called “Absentee Property Law”. Dr. Ishaq stated that the Legal Adviser of the Israeli Government recommended that the “guardian” of absentee property [in this case the Israeli occupation] can use the property and place it under his authority. The “law” comes in direct violation of all related international laws and international treaties, including the Fourth Geneva Convention. Dr. Ishaq further stated that an Israeli court plans to examine the Israeli decision in September of this year, and added that should Israel implement its plan, Bethlehem will be turned into a human warehouse with high density, as all uninhabited lands will be illegally confiscated from their owners. He said that Israeli plan targets Palestinian lands in Khirbit Al-Mazmourya, Khallit Ar-Ribway, Luka Mountain, Jabal Skhour, Wad Al-Jamal, Jaroun Al-Hummus, Cremisan and all of the lands that became isolated behind the Annexation Wall and the Gilo illegal settlement, in addition to lands in West Jerusalem. The Palestinian expert further said that all of the lands in question have been labeled by the Jerusalem Municipality under “Project 2020” as “Green Areas”. Areas that will be sold to Israeli institutions in order to complete the separation between Jerusalem and Bethlehem, as well as its separation from the rest of the West Bank by a complete belt and chain of settlements around the occupied city of Jerusalem. Ishaq called on the Palestinian Authority to act on the international level in order to raise awareness regarding this very dangerous Israeli plan, and added that “this plan is the biggest land theft carried out by Israel since its establishment in the historic land of Palestine in 1948”. On his part, Bethlehem Governor, Abdul-Fattah Hamayel, said that Israel is violating and bypassing all related international laws and treaties, and added that the Israeli “Legal System” is legalizing crimes and violations against the Palestinians and their property. Hamayel stated that the Palestinian Authority must act now in order to stop this illegal plan, and all of Israel’s illegal activities. The Governor also said that the Palestinian Authority does not trust the Israeli legal system, and that even if the Israeli Supreme Court decided ruled against the plan, the Israeli government will find ways to legalize the project the same way it did with numerous previous settlement projects that were eventually deemed “legal” by the Supreme Court. He also said that Israel is using these projects in order to foil any attempt to resume the peace process, and is aborting any chances of success of the efforts of U.S. Secretary of State, John Kerry. It is worth mentioning that Israel issued that “Absentee Property Law” in 1950 with the intention to illegally confiscate and rob Palestinian-owned lands that became part of the newly established state of Israel in the historic land of Palestine. The so-called law also states, “Every person who lives outside the state of Israel, or lives in a hostile state, is considered absentee; his lands and property are taken over by the state, and are placed under the authority of the absentee property guardian of the Ministry of Justice”. 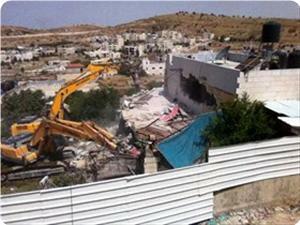 BADWAN AL-SALAYMEH'S Jerusalem home was demolished by Israeli occupation forces on May 29. Two bulldozers brought down the walls between which he and his 13-member family lived for over a decade, reducing the two-story building to an ugly pile of mangled steel and jagged concrete ruins. Heavily armed police forces misted the neighborhood, Beit Hanina, with tear gas and fired sound bombs at bystanders. At least two minors were arrested, one of whom was 12 years old, according to witnesses. 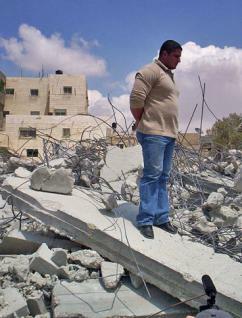 Although Al-Salaymeh had been paying monthly fines for the last two years, his home was leveled without prior notice. He was later informed that he will have to foot the bill of the demolition. "They want to kick all Palestinians out of Jerusalem," he said in an interview. "They want to make it a Jewish-only city, and to make us all move to the West Bank." "They wanted to demolish that also," Al-Salaymeh said, pointing to a small wooden shack in the corner of the yard, the sole standing edifice. "But I told them they had to bring it down on my head." 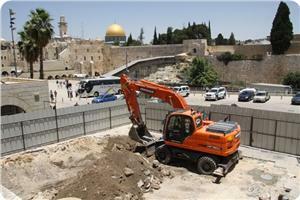 According to the Jerusalemites Campaign, it was the ninth demolition in East Jerusalem in a two-week period. Less than a week after the destruction of Al-Salaymeh's home, the Israeli-controlled municipality delivered demolition orders in several Palestinian villages in Jerusalem: Beit Hanina, Abu Dis, Al-Issawiya and Silwan. In Abu Dis, where students from the nearby Al-Quds University threw rocks at armored military jeeps, Israeli soldiers raised clouds of tear gas after posting demolition orders on homes. While delivering demolition orders, "Israeli police stormed the Beer Ayyub, Wadi Hilweh, and al-Bustan neighborhoods...taking several pictures," reports Ma'an News Agency. "Police and municipality staff also broke into a house belonging to [the] Rweidi family to check for any work carried out without a building permit, which are notoriously difficult for Palestinians in East Jerusalem to obtain." Topping off the week, Israeli forces then delivered demolition orders to another home in Beit Hanina, not far from the pile of destruction that used to be Badwan Al-Salaymeh's home. 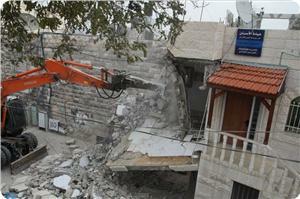 "Jerusalem municipality staff left a demolition order on the property of Hussein al-Kaswani," Ma'an read. "The 300-square-meter house was built 10 years ago and is home to 20 people." AS THE world marks the 46th anniversary of the June 1967 War, during which Israel occupied the remaining Palestinian territories and others, life in East Jerusalem has become grim for Palestinians. In order to "Judaize" the city--a euphemism for ethnic cleansing, of course--Israeli policy aims to push Palestinians out of the city by targeting them for arbitrary arrests, home demolitions, revoking their residency and imposing excessive fines, among other measures. This happens despite the United Nations General Assembly (UNGA) voicing landslide recognition of East Jerusalem as the capital of an independent Palestinian state in November 2012. The UNGA voted for a state of Palestine that includes East Jerusalem, the West Bank and the Gaza Strip. But when Palestinians woke up the next morning, checkpoints, tanks, soldiers and illegal settlements still dotted the map. Home demolitions also continued without pause. Since 2004, Israeli human rights group B'Tselem estimates, 442 Palestinian buildings have been destroyed in East Jerusalem, displacing at least 1,746 people (945 of whom were minors). The Al-Quds daily newspaper reported on May 28 that "450 Palestinian homes in the occupied city are currently awaiting demolition." The United Nations found that over 90,000 Palestinian Jerusalemites are presently at risk of displacement because 33 percent of all Palestinian homes in East Jerusalem lack permits. Israeli NGO Bimkom reports that 95 percent of all Palestinians who apply for permits are denied. "Any increase in [Israel's] ethnic cleansing tactics is inevitably tied into an implicit compliance from the international community, most prominently through the continuation of relations with Israel on an unconditional basis with regard to its human rights violations," Rima Awwad of the Jersualemites Campaign said in an interview. The ongoing assault on Palestinians in Jerusalem is part of Israel's larger hegemonic designs. As of June, almost 5,000 Palestinians were in Israeli prisons, more than 500,000 Israeli settlers were in East Jerusalem and the West Bank, and right-wing Prime Minister Benyamin Netanyahu has vowed to continue settlement activity. The Jerusalem municipality crews along with the Israeli police raided the village of Silwan this morning, and handed out three administrative demolition orders for a residential room and commercial facilities. Wadi Hilweh Information Center was informed that the municipality crews handed out an administrative demolition order to a commercial store that sells meat, which is leased to Isam Da’na in Al-Shaheed Samer Sarhan Street in Silwan. The store is 25 square meters, built from wood and iron since six months and fifteen individuals live off this store. They also hung an administrative demolition order on the door of a Hair Salon which is also 25 square meters leased out to Eyad Abu Sbeih and built from wood and iron, note that seven individuals live off this store. The municipality crews also raided a house for the Abbasi family in Ein Al-Lozeh and handed Majdi Abbasi the administrative demolition order for a residential room he rehabilitated for living purposes recently. Abbasi explained that the room is only 9 square meters and he had cleaned it and renovated it from the inside. 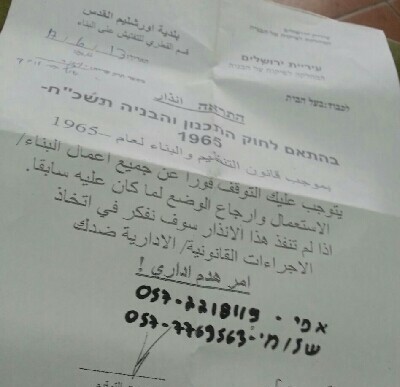 Another administrative demolition order was handed out to Adel Siam, and to a car-wash in Bi’er Ayoub. Furthermore, pictures were taken for the neighbourhoods of Silwan, alleys and entrances. The Israeli Occupation Forces (IOF) demolished on Monday morning Palestinian facilities in Yatta town south of al-Khalil in the occupied West Bank. The Israeli soldiers stormed the town accompanied with bulldozers and Intelligence officers where they demolished public health facilities under the pretext of being built without a permit, local sources said. Meanwhile, the Israeli soldiers were intensively deployed in Dura city searching for wanted persons who opened fire towards an Israeli military vehicle near Khursa junction five days ago. Local sources confirmed that the occupation forces raided Dura where they stormed and searched a number of houses and erected military checkpoints. For their part, the PA security forces tightened its security measures in the city looking for the wanted persons, the sources added. Eyewitnesses confirmed that the PA forces seized video surveillance cameras near the incident to know the identity of the armed persons. 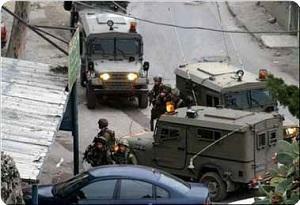 The sources pointed that the PA forces summoned youths living near the scene for interrogation. The applied research institute Arij described an Israeli legal advisor's talk about the confiscation of Palestinian real estate under the absentee property law that includes Palestinian structures in east Jerusalem as the "greatest Israeli plunder of all time." Arij warned in a press release against Israel taking over dozens of properties in the occupied West Bank and Jerusalem using the absentee property law. This law dates back to 1950 when the Israeli occupation devised it in order to justify the confiscation of Palestinian lands and homes whose owners had been displaced from during the 1948 Nakba at the pretext of preserving them without having a right to sell or dispose of them except for development purposes. However, this law was modified many times by the Israeli regime in order to annex more Palestinian real estate to Israel and expand its settlement projects. Arij said that "the absentee property law has undergone several amendments in order to annex the maximum area of land for the benefit of settlement expansion projects in the occupied territories; the last of which was in 2004, when the Israeli government issued an amendment allowing the settlers placed in the properties of the absent Palestinians to dispose of such real estate by selling them to the so-called Israeli development authority that falls under the control of the Israel land department which gives them for companies like 'Amidar' and 'Hmenota' which, in turn, use them for settlement building and expansion, especially in east Jerusalem." The Israeli occupation authority (IOA) forced Jerusalemite Hasan Abu Hidwan to raze part of his home in the Old City of Jerusalem with his own hands. The Israeli municipality said that the additional part of the building was built without permit and should be knocked down. Wahdan said two weeks ago that an Israeli court gave him until 30th May to remove the 25-square-meter section of his home or else pay 30,000 shekels fine. He told Wadi Hilwa information center that he built the additional room four years ago only to be slapped with a court ruling ordering its demolition. Wahdan said that the court imposed on him a “light” fine of 2,500 shekels if he knocked down the room with his own hands. Hamas has strongly condemned the Israeli continued Judaization projects, calling on the international community to pressure Israeli authorities to stop settlement projects in occupied Jerusalem and the West Bank. In a statement issued on Thursday, the movement also called on the PA to stand against Israeli settlement and to reject the so called economic peace that only serves the occupation’s criminal schemes. Hamas's statement came in response to the Israeli building of hundreds of housing units, settlement expansion, and excavations conducted around Al-Magharba Gate and Al-Buraq Wall in Jerusalem. The movement warned of those Judaization projects, stressing that the occupation authorities will not be able to blur the Palestinian Arab and Islamic identity and history. The movement also called on the Palestinian national forces to stand behind their people’s aspirations to achieve the Palestinian national reconciliation and to stop security coordination with Israel in response to Israeli forces and settlers’ attacks. Israeli occupation police closed main streets leading to the Old City in occupied Jerusalem on Thursday, local sources said. The Israeli decision to close the streets came due to the preparations for the organization of the Formula 1 race, which will take place on Thursday and Friday in the occupied city of Jerusalem with the participation of the Ferrari World team, under the sponsorship Kaspersky Company specialized in computer protection programs. The police declared, in a statement, their intention to close the streets leading to al-Khalil, Asbat, and Al Magharibah Gates in the Old City on Thursday and Friday, according to Jerusalemite sources. The race will be launched from the neighborhoods in the western part of Jerusalem towards the eastern part, in the vicinity of the Old City wall. For its part; the Jerusalem's Sports Federations Group asserted that the Ferrari race comes within the framework of the Judaization plans implemented by the occupation in the city of Jerusalem. Meanwhile, the Israeli police, accompanied with bulldozers and trucks, evacuated on Wednesday Wadi Joz car park east of Jerusalem claiming that it belongs to Israel Lands Administration (ILA). Siyam, Abu Ta'a, and Farhan families confirmed that the car park was established on their own lands, declaring their intention to prosecute the ILA for its racial policy. The families confirmed that the Israeli authorities have notified them since 6 months to evacuate the car park. The park owners affirmed that they have official documents confirming their ownership of the land, where they appealed to the Israeli Municipal Authorities which permitted them to rehabilitate the park to be used as a car park, however they were surprised yesterday by the ILA breaking into the park. Arabs in the Negev desert announced a general strike on Thursday protesting the Israeli authorities’ planned forced eviction of them. Forces in the Negev said that the strike was meant to object to the Prawer Plan on relocation and resettlement of Negev Bedouins that would be tabled with parliament soon. They said that the protests would start with marches and demonstrations in front of the Israeli government compound in Beersheba. The Israeli antiquities authority started new diggings near Al-Maghariba Gate square in Silwan district, north of the Aqsa Mosque, as a prelude to building a huge Jewish center. Wadi Hilwa information center said on Wednesday that the Israeli antiquities authority started its construction works on a piece of land belonging to Siyam family and erected metal poles inside holes that had been made last Monday at the entrance of a residential alley in Wadi Hilwa neighborhood. The center added that the Israeli police escorted the Israeli workmen at the digging sites at the pretext they had permits allowing them to do their jobs. However, the workmen refused to show these permits to the residents. Residents from Silwan district had managed to prevent two three days ago the workmen from continuing their digging works and setting up tin sheets at the entrance of their populated alley where their homes are located, but the workmen came again on Thursday under police guard and resumed the diggings. According to the center, the Israeli occupation authority wants to establish a Jewish archaeological center of seven floors in Al-Maghariba Gate square. The center extends over an area of 3,000 square meters. Ali Iyad, with the Cliff Hotel in the background. Along with many other West Bank Palestinians who own land and property in East Jerusalem, my family is caught in a Kafkaesque trap: We are considered absentee owners - and the Israeli government has the right to take our homes away from us. Three weeks ago, the Israeli Supreme Court discussed whether or not they should consider my family and me absentee owners. I was born in Abu Dis, and I live barely 300 meters from my childhood home there - and yet, under Israel’s 1950 Absentee Property Law, I can be considered an absentee owner, and my property can be confiscated by the state. The hearing was just the latest in a string of ironies with which I have had to deal in the last decade. From 2003 onwards, the State of Israel has claimed that my family house in Abu Dis, which is very close to the Jerusalem municipal border, is in fact inside Jerusalem. Since I am a resident of the West Bank, this has enabled the state to apply the Absentee Property Law to the house - which my father converted in the 1960s into the Cliff Hotel - and define us as absentees in relation to the property. After Israel annexed East Jerusalem in 1967, and applied Israeli domestic law to the territory, properties in East Jerusalem were considered to be in Israel, but their owners in the West Bank were considered absentees - even though they never left their places of residence. According to Israeli law, this now gives the government the right to take my home away from me. This Kafkaesque set of circumstances affects many Palestinians resident in the West Bank who own land and property in East Jerusalem. The Supreme Court hearing, therefore, gave us some reason to be hopeful. The judges showed a willingness to discuss the principle issue of applying the law to East Jerusalem properties owned by West Bank Palestinians, and they have now summoned the Attorney General to defend the state’s position at the next hearing. 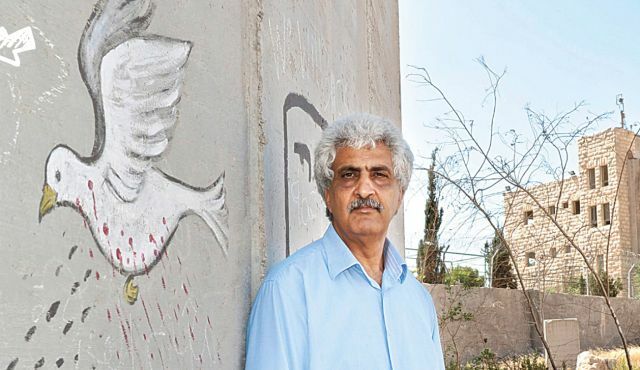 In their decision to schedule another hearing, the judges hinted that the position of former Attorney General Meir Shamgar should be taken into account: He instructed the government in 1969 not to apply the law to West Bank residents. However, some of the judges indicated they would be satisfied with an existing mechanism by which East Jerusalem properties would be expropriated through the Absentee Property Law, and then owners like me would turn to a special committee to release the property; though its criteria for such a release are not stated in the law, and there is no transparency as to what they are or if such clear criteria even exists. Whatever the High Court may decide, the longstanding saga of my attempts to maintain ownership of the house that my parents passed on to me and to my brothers is not likely to end soon. Early this year my lawyer, Avigdor Feldman, received a notice signed by the Minister of Finance of "intention to acquire possession of property that is urgently needed for a public purpose,” which would confiscate the house for 10 years. Since the house is near the route of the separation wall in Abu Dis, the State of Israel can use security considerations to bypass judicial oversight and take over the property, regardless of the final decision in the Absentee Property Law case. In the case of my Hotel, the ends seem to justify the means. For many years my calendar has overflowed with lawyers’ meetings, administrative hearings and court decisions. I try to keep my calm, although this is my home and my parents’ house. In 1954 my father built this large, impressive house on a hill overlooking Jerusalem. It is precisely the location of the house - once our source of pride - that probably makes it now such a desirable strategic asset for Israel. In the seventies, when the Cliff Hotel still functioned as a hotel, I managed it for 15 years, and that is where I met my wife and we lived with our two daughters when they were young. That is why, like the "present absentees" inside Israel, I cannot accept being called an absentee. I am not an absentee, I am here. Accepting this definition would mean forgetting my history and giving up my connection to the past. Ali Ayyad was born and raised in Abu Dis and shares the ownership of the Cliff Hotel with his siblings. A businessman, he managed the Cliff Hotel between 1979-1996. The Israeli occupation authority (IOA) ordered members of the Ka’abna tribe to leave their Bedouin homes near Beit Hanina village in occupied Jerusalem. Local sources said that the IOA ordered eight families comprising 53 individuals to leave their homes, which are adjacent to Bir Nabala to the north west of Jerusalem. They said that the family members staged a sit-in since the morning hours on Tuesday in protest at the eviction notice. Salem Abu Dahuk, the chairman of Jerusalem Bedouin Society, said that the suffering of the Ka’abna family with occupation is a long one. He said that the tribe’s suffering started with the establishment of the Israeli industrial area Atarut on the land of Bir Nabala, adding that the racist, separation wall then divided their land and deprived them of basic services such as education and health yet the tribesmen remained steadfast and refused to leave their land. 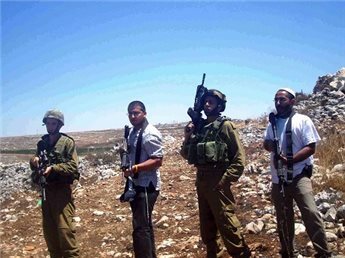 Several armored Israeli military vehicles invaded on Wednesday morning [June 12 2013] Barta’a Ash-Sharqiyya village, in the Jenin district, in the northern part of the occupied West Bank, and demolished a home and a shed. Local sources have reported that several armored vehicles and military bulldozers invaded the village, and demolished a 200 square/foot home that belongs to resident Ahmad Omar Qabha. Soldiers also demolished a shed that belong to the resident. The sources added that the army declared the area a closed military zone, preventing residents and journalists from entering of leaving it. The village has been subject to frequent military invasions and violations, as the soldiers recently demolished nearly 10 sheds near its southern entrance. The army claims that the properties did not receive construction permits from Israel, and are located outside of the zoning area of the village.